Rev. Fr. Democrito Umagtam as first parish priest of the new parish of Our Lady of Perpetual Help, Canan, Malasiqui, Pangasinan, effective March 19, 2010. Rev. Fr. Manuel delos Santos as parish priest of Cristo Divino Tesoro Parish, Buenlag, Calasiao, Pangasinan, effective March 19, 2010. Rev. Fr. Rolando Salosagcol as member of Team Ministry of Sts. Peter and Paul Parish, Calasiao, Pangasinan, effective March 19, 2010. Rev. Fr. Fernan Estrada as member of the Team Ministry of the Epiphany of the Lord Parish and concurrently Spiritual Director of the Mary Help of Christians High School Seminary, Binmaley, Pangasinan, effective March 19, 2010. Rev. Fr. Genaro Herramia as member of the Team Ministry of the St Thomas Aquinas Parish, Mangaldan Pangasinan, effective March 19, 2010, concurrently Director of St Thomas Catholic School Mangaldan. Rev. Fr. Reydentor Mejia as first parish priest of the new Parish of San Lorenzo Ruiz, Wawa, Bayambang, Pangasinan effective March 19, 2010. Lord God the creator of all things Your Spirit moved over the face of the waters at the dawn of creation You gather the seas into their places and direct the courses of the rivers We praise you for the gift of water Now our land is dry and barren, thirsting for life-giving rain Send rain upon the earth so that it will bring forth life May we use only the water we each need And let us take care of and give encouragement to All those whose livelihood depend on the produce of the land. After every invocation please say: We beseech you hear us. Jesus, Our Lord We beseech you hear us Jesus our Lord, protect all tillers of the oil We beseech you, hear us Jesus our Lord, bring to all a true knowledge of the stewardship of the land We beseech you hear us Jesus our Lord, preserve and increase our fields and flocks. We beseech you hear us Jesus our Lord, bless our fields We beseech you hear us San Isidro, pray for us. Sustaining God, we receive the fruits of the earth from your generous hand, yet now we observe the eager earth frustrated by lack of rain. Have mercy Almighty God on our parched land. Bring peace to our worried minds and soothe our anxious hearts now and forever. Tinipon Yo ray dayat diad saray pasen da tan inturo Yoy panagosan na saray ilog. Idadayew mi Kayo ed say langkap Yod sikamin danum. Natan namamagaan tan aliwa lan mabona so dalin min napapaet ed say napanbilayan ya oran. Ibaki Yo pay oran ed mundo pian sikatoy makapangiter na bilay. Amin ya say panbibilay da et maniilalo labat lad saray bunga na dalin. Kada kasumpal na pikakasi, say ebat: Talineng Mo kami. Jesus, a Katawan mi Talineng mo kami Jesus, a Katawan mi, ilaban Yo pa ray amin ya dumaralos na dalin Talineng mo kami Jesus, a Katawan mi, iter Yod amin so tuan kakabatan na nipaakar ed say panangasikaso na dalin Talineng mo kami Jesus a Katawan mi, iyagel tan pabolaslas Yo pa ray kaomaan tan ayayep mi. Talineng mo kami Jesus a Katawan mi, bendision Yo pa ray kaomaan mi. Talineng mo kami San Isidro, pikasi mo kami. Dios a managlegpet, nanaawat mi ray bunga-bunga na dalin ya manlalapud mabunlok ya lima Yo, balet natan, nanaimatonan mi so mapilalek ya dalin a nalelepes lapud say kakulangan na oran. Mangasi Kayo, O Matalonggaring ya Dios, ed saray dalin min namamagaan. Itdan Yo pay kareenan so nagogonigon ya kanunotan mi, tan tambayoen Yo pa ray mapagan kapusoan mi, natan tan diad ando lan ando. 15 February 2010 – Dagupan City. Two hundred seven priests from the 5 dioceses and 1 archdiocese gathered together for a one-day celebration of the First Metropolitan Clergy Day. The dioceses are the Metropolitan Archdiocese of Lingayen-Dagupan and its suffragan dioceses of Alaminos, Urdaneta, San Fernando (La Union), San Jose and Cabanatuan (Nueva Ecija). The celebration was opened with the praying of the rosary led by Msgr. Artemio L. Rillera. A Eucharistic Adoration followed with Msgr. Sofronio A. Bancud, the Bishop of Cabanatuan, presiding in the celebration. Msgr. Socrates B. Villegas, the Archbishop of Lingayen-Dagupan, gave the reflection during the holy hour. Msgr. Renato P. Mayugba, the Auxiliary of Lingayen-Dagupan, was the main presider in the Eucharistic celebration which was celebrated later in the morning. Msgr. 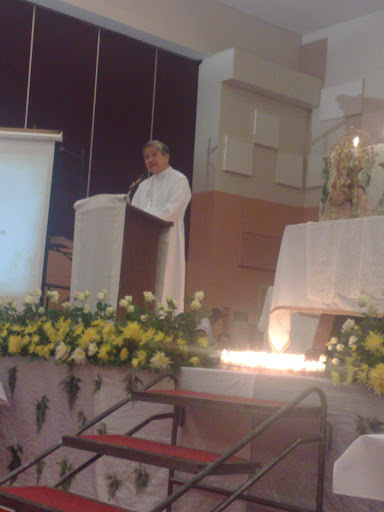 Mylo C. Vegara, the Bishop of San Jose (Nueva Ecija) gave the homily. Msgr. Marlo M. Peralta, the Bishop of Alaminos and the Bishop Emeritus of Alaminos, Msgr. Jesus A. Cabrera, were also present during the celebration. Parlor games were played after lunch. Basketball games and lawn tennis were played in the afternoon between the teams of the different dioceses. 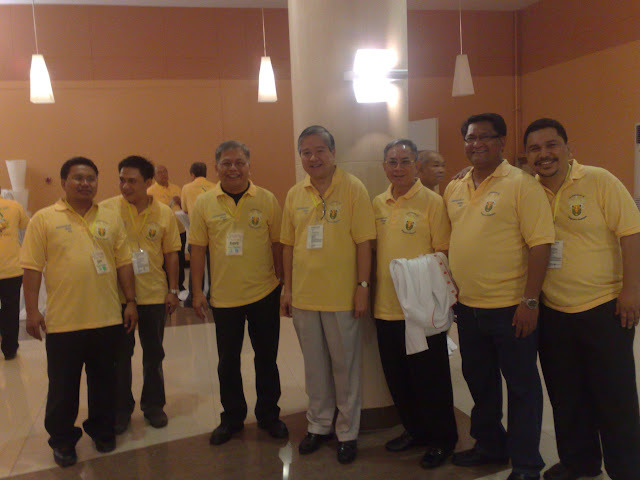 The First Metropolitan Clergy was held at the Stadia, Dagupan City. 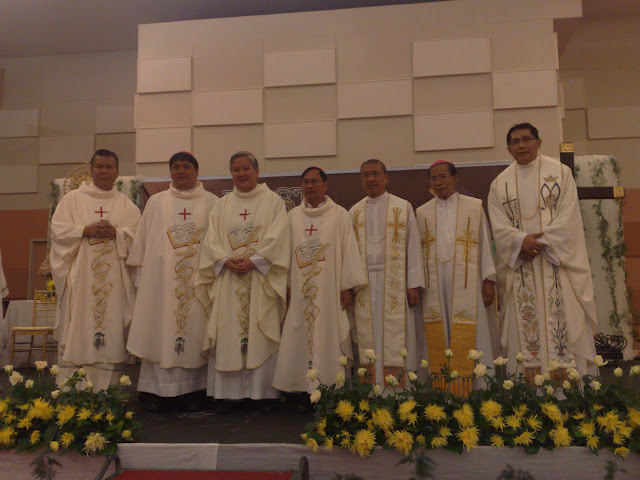 The Bishops (L-R) Bishop-Emeritus of Alaminos, Bishop Jesus A. Cabrera, Bishop Mylo C. Vergara of San Jose, Archbishop Socrates B. Villegas of Lingayen-Dagupan, Bishop Renato P. Mayugba, Auxiliary of Lingayen-Dagupan, Bishop Sofronio A. Bancud of Cabanatuan, Bishop Artemio L. Rillera of San Fernando (La Union) and Bishop Marlo M. Peralta of Alaminos.